Yesterday, Sarah looked at a number of gun control measures that could prevent mass killings like Friday's massacre in Newtown, Conn. But it's worth noting that at the state level, gun laws have been getting laxer, not more stringent, in recent years, and at times preposterously so. Here is a sampling of the most lenient state gun laws in the country, to give a sense of exactly how lax the current legal regime is. 1. Concealed carry at 16 — with no permit: Most states that allow people to carry a concealed weapon on their person require gun owners to obtain a permit before doing so. But four states — Alaska, Arizona, Wyoming and Vermont — allow concealed carry without any permit. That means, the Brady Campaign's Brian Malte tells me, that Jared Loughner was in full compliance with Arizona law up until the moment he used his concealed weapons to kill six people and severely injure Rep. Gabrielle Giffords. Vermont, however, stands out from the pack because it allows people as young as 16 to conceal carry without parental permission, as well as buy handguns. So a Vermont teenager aged 16 can't legally go to an R-rated movie alone or join the military, but he can buy a handgun and carry it in his jeans and be completely within the limits of the law. 2. Property rights end where gun rights begin: According to the Law Center to Prevent Gun Violence, 17 states, including Oklahoma and Florida, bar employers from preventing their employees from bringing guns to work and keeping them locked in their vehicles, even if those vehicles are on the property of the employer. Indiana and North Dakota allow employees to sue their employers for damages if asked about gun possession. The North Dakota statue specifically bars employers from asking if employees' vehicles parked on company property have weapons in them. Georgia bars employers from making employment conditional on not bringing guns to work. 3. License to kill, even in public: A class of laws, called "castle doctrine" statutes by supporters, in most states clarify that homeowners who feel threatened in their domicile have no duty to retreat from threats or to refrain from the use of deadly force. But most states also have such laws that apply to conflagrations in public places, far removed from the shooter's "castle." That is, these 34 states allow people to use deadly force when they feel threatened in public. These laws vary in severity. Five states, including Ohio and Missouri, only provide for the use of deadly force when the threatened party is in a vehicle. But most states with laws along these lines, most notably Florida, follow the American Legal Exchange Council (ALEC) model law, which bans police from arresting people who use deadly force in public unless there is probable cause that they did not act in response to a perceived threat, and which grants broad immunity from prosecution and civil action to shooters in such case. Indeed, someone who shoots and kills in such a circumstance can himself sue law enforcement agencies if they press charges. Some researchers have found that castle doctrine laws of this scope, frequently dubbed "stand your ground" laws, have caused a statistically significant increase in homicide rates. The most notorious case where such statutes came into play was the Trayvon Martin case in Sanford, Fla., where George Zimmerman pursued and killed Martin because he states he perceived a threat, despite Martin having no weapons and not having interacted with Zimmerman at all. Zimmerman was eventually charged with second-degree murder by a special prosecutor after the state's attorney declined to press charges. Zimmerman could still have the charges dismissed under the "stand your ground law" if he demonstrates to a judge that he felt threatened. 4. Open carry without a permit: Most legal disputes around carrying guns in public involved concealed carry. But open carry, which is arguably more threatening to surrounding community members, is largely unregulated. Thirty-five states allow open carry of handguns without a permit, while only three (plus the District of Columbia) ban it outright. Forty-seven states plus the District allow open carry of long guns (that is, rifles or shotguns) in public, while only three ban it. 5. 8-year-olds with shotguns: Federal law mandates that licensed gun dealers only sell long guns to individuals 18 and older, and handguns to individuals 21 and older. But not all legal gun sellers are federally licensed. For instance, many gun show participants sell guns legally without a federal license. That means that many under 18 and 21 are capable of buying guns legally. As mentioned above, Vermont allows children as young as 16 to buy handguns without parental consent. What's more, federal law allows all individuals 18 and older to possess handguns, and has no minimum age for long gun possession. Only 20 states and the District of Columbia have a minimum age for long gun possession. The age is usually set at 18, but in New York it's only 16, and in Montana it's 14. So in Helena, one can legally own a shotgun before graduating from 8th grade. And in the 30 states with no such minimum age, you could own one when you're in elementary school. Further, only 28 states and the District set a minimum age for sales from unlicensed gun dealers. Twenty-two states, then, have no such minimum age. And in three states, the minimum age for sales only applies to long guns. So in 22 states it is perfectly legal for an 8-year-old to pick up a handgun at a gun show, though he cannot legally possess it. In 20 states that 8 year old can both legally buy a shotgun and possess it. 6. Guns at schools: In 2010, Kansas passed a law allowing the concealed carry of guns in K-12 schools, in violation of the federal Gun-Free School Zones Act, which criminalizing the carrying of firearms in specified school zones. That act was ruled unconstitutional in U.S. v. Lopez as exceeding the federal government's powers under the Commerce Clause, and a revised statute was passed that limits the ban to guns "involved in interstate commerce," so it is possible that the Kansas statute does not run afoul of federal law in all cases. This past week, Michigan followed suit, with state legislators passing a law allowing concealed carry in schools, bars, daycare centers and churches. Gov. 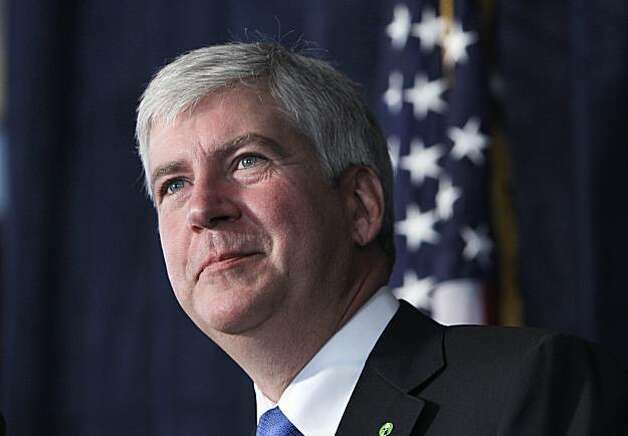 Rick Snyder (R) has not signed the bill into law, and its ultimate passage is now in doubt due to the Newtown incident.